12 Jun 2016 Washington, D.C.
“As Daesh [ISIS] loses ground, they are becoming more desperate and, as a result, we have seen an increase in chemical attacks across Kurdistan,” declared Gen. Bahram Arif Yassin, commander of the Peshmerga 7th brigade in Iraq. The commander’s brigade has been deployed to the anti-ISIS frontline near Bashiqa, a Kurdish-controlled town — about 20 miles north of ISIS-held Mosul — in Sunni-majority Nineveh province, where Arabs and Kurds have competing claims to territory. His comments come as the International Luxembourg Forum on Preventing Nuclear Catastrophe, a think-tank on proliferation, warns that ISIS is “actively trying to acquire weapons of mass destruction [WMDs],” noting that the jihadist group has already carried out several chemical attacks in Syria, which borders Iraq’s Nineveh province. ISIS has launched numerous chemical attacks in Iraq as well, particularly in the northern part of the country, which includes Nineveh province and lies along territory controlled by the KRG and the central government in Baghdad. The chemicals principally used by ISIS have been identified by the Peshmerga and experts as chlorine and sulfur mustard. “Both of which are actually quite poor weapons by modern standards,” Dan Kaszeta, a former U.S. Army chemical officer and Department of Homeland Security (DHS) expert who is now employed by a private consultancy group, told the Associated Press (AP). Nevertheless, some of the chemical attacks by the group have wrought tremendous havoc. In March, ISIS launched two chemical attacks in northern Iraq’s Kirkuk province, killing nearly 600 people, including women and children and wounding at least 100. Moreover, hundreds of other Iraqis were displaced by the attacks, which occurred in the Shiite Turkmen-controlled town of Taza. That same month, U.S. special forces captured an ISIS jihadist in Nineveh province identified by Iraqi officials as “Sleiman Daoud al-Afari, who worked for Saddam Hussein’s now-dissolved Military Industrialization Authority where he specialized in chemical and biological weapons,” reports the Associated Press (AP). “They said al-Afari, who is about 50 years old, heads the Islamic State group’s recently established branch for the research and development of chemical weapons,” adds the report. He was arrested in Nineveh’s town of Tal Afar, located about 40 miles west of Mosul. The top ISIS “weapons emir” told American troops that the jihadist group had plans to use chemical weapons, namely mustard gas, against the United States military and its allies fighting them, including the Kurds, unnamed U.S. defense officials told the Military Times. 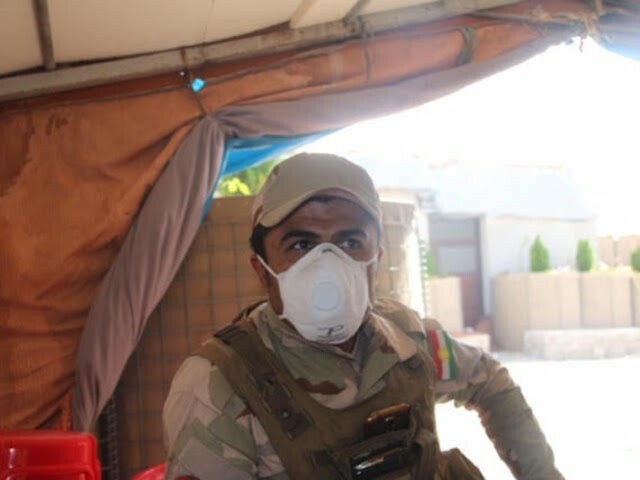 Dlovan Shukry Essa [pictured above], a Peshmerga fighter who has been charged with investigating possible chemical attacks against the 7th brigade, told Breitbart News that he lacks the proper gear to safely carry out his responsibilities. ISIS launched a chemical attack against the 7th brigade in recent weeks that was a near miss, noted Essa, adding that, fortunately, the mortar carrying the chemicals landed away from him and the other troops. The only tool that Essa has been provided to investigate chemical attacks is far from the full body personal protective equipment (PPE) coveted by professionals in his position. 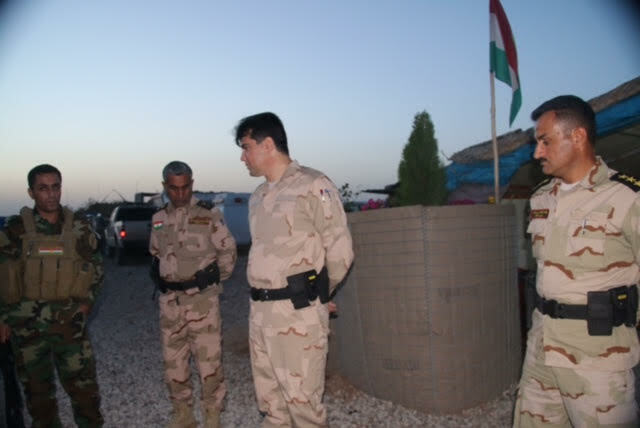 Essa conceded that Peshmerga fighters lack the proper training to deal with chemical attacks. Earlier this year, U.S. defense and intelligence officials said that ISIS had mounted at least a dozen chemical attacks in Iraq and Syria. It remains unclear specifically how many chemical attacks the terrorist group has carried out. U.S.-led coalition airstrikes and special operations raids have reportedly targeted ISIS’ chemical weapons infrastructure. Despite the devastating attack in northern Iraq in March, experts have said the jihadist group lacks the capability of launching a large-scale chemical weapons’ assault. Peshmerga Gen. Yassin echoed U.S. officials and Iraqi Major General Najm Abdullah al-Jubbouri, commander of Nineveh operations, in saying that ISIS has lost territory. The U.S.-led coalition has reported that ISIS lost 40 percent of its territory in Iraq last year and about 20 percent in Syria.